Game-collector John Hancock discusses his plans for opening a game museum, how he scored some of the most valuable games in his vast collection, and his thoughts on whether or not digital games impact the value of physical media. Who says a museum has to be austere and as dry as the dust coating its exhibits? There are museums for tap water, dog collars, lawn mowers, and even awful paintings and other artwork. Why not video games? John Hancock, collector of more than 10,000 games across over two dozen systems and counting, talks about his desire to open a museum to help preserve gaming history, how he organizes his collection, and the impact of digital games on his beloved cartridges and optical discs. 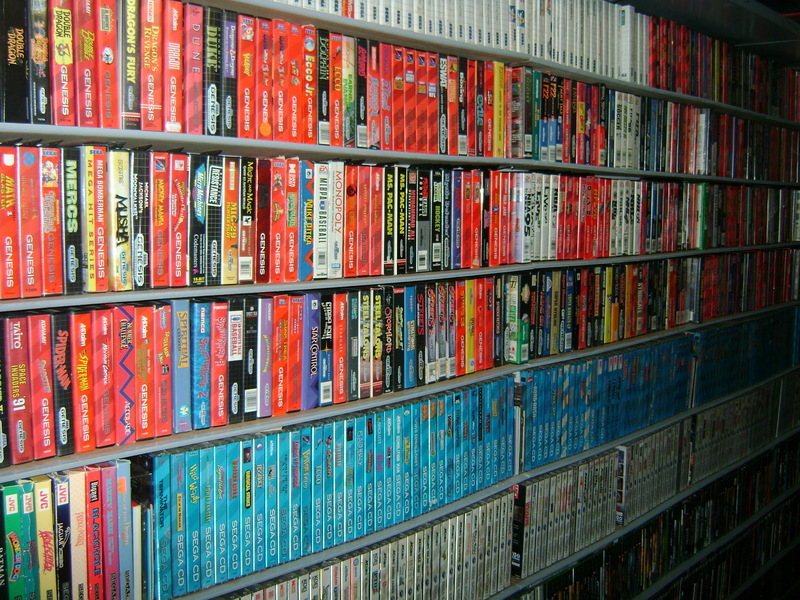 Arguably the most expensive wall in John’s home, his “Wall of Nintendo” houses cartridges, consoles, and accessories for Nintendo’s enduring line of hardware. How did you organize your room? It seems like you have as much fun showing off and talking about your collection as you do building it up. The first thing to know is that I didn’t do it to myself. I would have been overwhelmed, and I’m not the biggest builder guy, even though I look like the guy from Tim the Toolman Taylor’s show [Al Borland character on Home Improvement]. I have a single-car garage, and when we bought the house, it was just a mess. Paint on the floor, the walls were uneven drywall, and the garage had one electrical outlet. With the help of my father-in-law, I added a bunch of outlets and carpeted the floor over about a year and a half. I just took plywood, cut it into strips, and used five-inch brackets and a stud finder to measure out how many shelves I would need, especially if I wanted to expand. I put Nintendo on one side, Sega on another, and Atari on another. Within the last nine years, I’ve outgrown it. I outgrew it about four years ago. There’s stuff in boxes. I have it organized as nicely as I can, but I could easily fill a much bigger room. I think about, What if I had a thousand square feet? What if I could dedicate an entire wall to Atari systems? The 5200, the 2600, the computers, the Jaguar — just one entire wall. I think that would be awesome. One of these days, that’s how I’ll organize it. There’ll be the Atari mega-wall, and Sega will have its own mega-wall, and Nintendo will have one. Hopefully, one day this will all be in a museum. I think there are collectors out there who are super specialized. They have prototypes, or shoot for, like, all the Super Nintendo [models]. I want to have the ultimate comprehensive collection. Something that covers the basics as best as possible. How much thought have you given to the museum idea? Would you like to sell the collection to a museum, or open a small place of your own? I’ve had a couple of people show interest, but I have put a lot of time and effort into this. It’s all willed to my son and my daughter. I would like to have control over that in a museum to make sure it gets the appropriate [level of care]. Actually, I’d like to be the curator of my own museum someday. I’ve had a couple of people contact me about doing something, but it just wasn’t a good fit. That’s the nicest way to say it. They wanted to use my collection for a museum, and I wasn’t really sold on what they were going to do with it. I think the collection is more valuable kept together. When I get old and crotchety, I’m not going to want to move around a lot. I want to put it in a place where the public can come and see all of it. 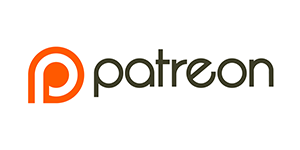 I consider myself a retro-gaming historian or specialist, and I’d like to continue to advocate for the hobby, and make sure that it can be remembered. Whether the ROMs in the games continue to work or not, the packaging is just as fun for me to collect. Left: The Cheetahmen II (NES), a never-released sequel to the original. Only 1500 copies were printed. Although the game has more bugs than pixels, cartridges fetch upwards of $600. 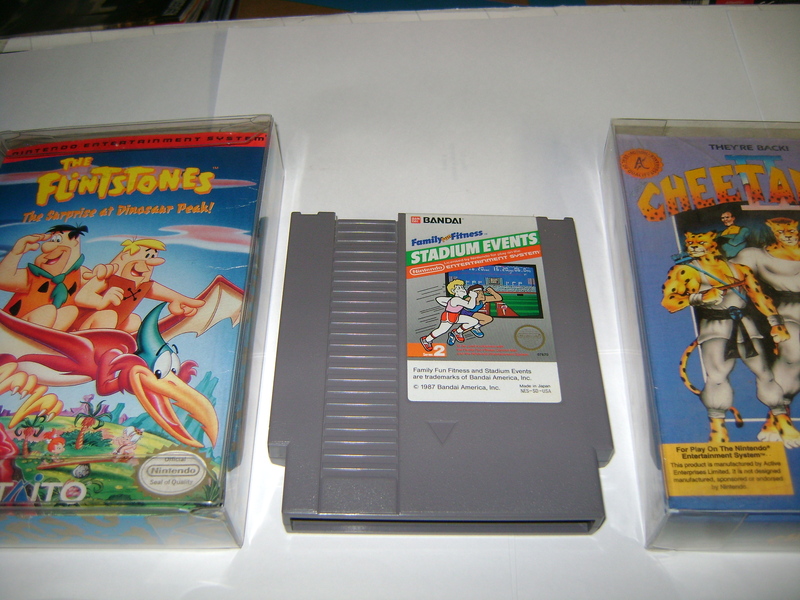 Center: Stadium Events is one of the rarest cartridges for the NES. Complete-in-box (CIB) copies have sold for over $100,000. Right: The Flintstones: Surprise at Dinosaur Peak (NES). According to rumors, it was released as a rental-only title for Blockbuster Video’s chain of stores. Copies go for more than $600. What is the single most valuable item in your collection, and what’s the story behind how you got it? It’s easy to say Stadium Events [for NES]. I have some other interesting stuff, though. I have a loose Outback Joey in a plastic case. It’s much rarer than Stadium Events. It came with the Heartbeat Personal Trainer, which is the same [hardware] as the Sega Genesis. 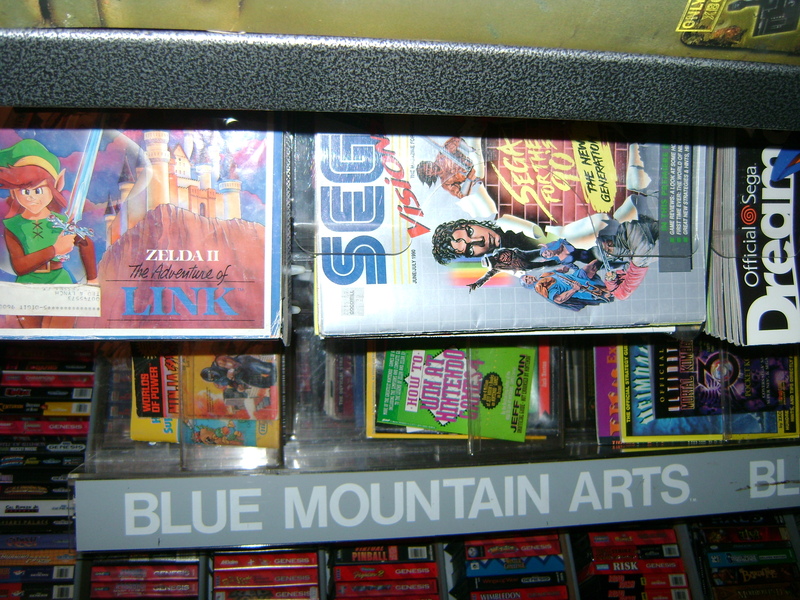 You can stick the [Outback Joey] cart into a Genesis, but you can’t play it. But my Stadium Events game is probably my most valuable item. It’s worth around $6,000 now. I got mine for a hundred bucks. The story behind that is, the Classic Gaming Expo from about a decade ago started their Question-Mark-Box mystery auctions. All the money went to the Special Olympics. You donated money and didn’t know what you were going to get. People weren’t really excited about it. The previous auction ended up being an [Atari] 7800. Some guy spent around $130 and didn’t get anything good. What Classic Gaming Expo did was piecemealed a Magic Card 2600 game together from an original, nonworking product. Magic Card is super rare, sought after. At the time, I wasn’t really pursuing Atari 2600. I came to the auction late, I had 100 bucks to my name, I won, and immediately I got people wanting to deal with me. At the time, 10 years ago, I was only missing one game from my NES set, and that was Stadium Events. I put a bid out: “I’ll trade this for Stadium Events.” A guy halfway across the United States said, “Not only will I buy Stadium Events off of eBay for you, I’ll throw in a sealed Cheetahmen II, Rainbow Island, and some other stuff, boxed, for your collection.” I already had a sealed Cheetahmen II, which I immediately sold, and used that money to work on the Sega Genesis collection. So I got Stadium Events and a bunch of other games for negative money, considering their worth. 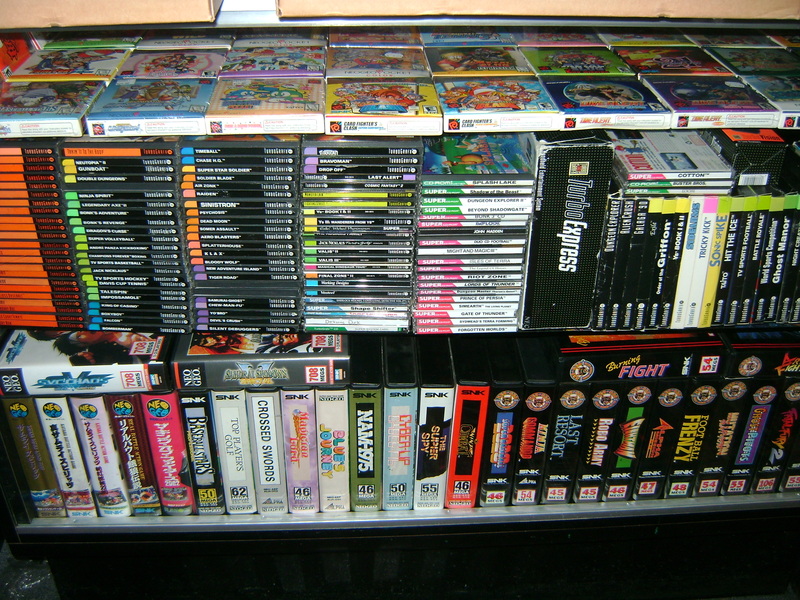 Games for the Neo-Geo, TurboGrafx-16, and other consoles. Setting monetary value aside, what are some of your personal favorite items in your collection? That’s easy. I have a white Astrocade. That’s my pride and joy. I’ve got four; I gave one to a friend, I had a nonworking one that I gave to another friend, and I have one somewhere in my attic. It’s kind of touchy, though. Astrocades are really touchy. I bought a boxed Speed Way IV. Those are tough to get. I scored that over the past year; it’s fully operational. I have some PONG units. My Sears Tele-Games Motocross Sports Center. It’s funky, one of those late PONG units that had non-PONG games as well as PONG. If you remember Stunt Racer by Atari, Tele-Games made the same console, but they threw a PONG game into it. It came with four paddles. That’s my pride and joy in terms of PONG stuff. I have some homebrew stuff that’s super rare. My wife had a cancer scare, so for one of our early shows, we did a limited run of 2600 homebrew games, and all proceeds went to the American Cancer Society. It was special that we were able to do that. She ended up not having cancer, but it was scary. Show [conference] exclusives are fun because there are only 20 or 30 copies and then they’re gone. War of the Robots, which was an early exclusive for Classic Gaming Expo 2004, for Vectrex, kind of plays like Battlezone. There were only 50 copies or so of that. I could go on and on. My boxed Robotron — that’s my favorite game. 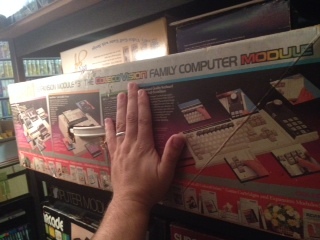 John places his hand next to the gargantuan box of the Coleco Adam computer for size comparison. Every gamer has a favorite game. How did Robotron become yours? Robotron was an arcade game, but my favorite is the Atari 7800 version because that was one of the first games when I set about re-amassing a games collection. I enjoyed it so much that I made a custom controller for it. I took two Tach-2 controllers and zip-tied them. It’s like the ultimate Robotron controller. I tried some different things with dials and glue, but it just didn’t work. So I got two Tach-2 controllers, and my score doubled. Robotron, to me, is the best way of understanding someone with ADHD. If someone would say, “What’s it like to have ADHD?” — look at Robotron and how chaotic it is. Everything is coming at you all at the same time. I just love that. I like the pressure. I like knowing that you’re never going to beat the game. The game is going to beat you. It’s just a matter of time. It has a neat control style. It’s just a really good game, and it’s on [practically every system]. I try to get every version that I can, but I think the 7800 version is the best. But Robotron is what I call an evergreen game, a game that can stand the test of time. It’s constantly on every system. Robotron is one of those. Midway Origins for Xbox 360 and PS3 has Robotron on it. A collection the size of yours has so much great trivia behind it. What is some of your favorite trivia pertaining to your favorite games? There’s a ton of lore out there. I like Easter eggs, or stuff that programmers have said about making their games. Eugene Jarvis was the one who made Robotron. The story about him coming up with the control scheme was that he broke his hand. He came up with the game’s control style because he was immobile. I thought that was an interesting bit of history. Strategy guides, magazines, and games. What other stories do you have about acquiring hard-to-find systems and complete sets? I can tell you my boxed-NES story. I’d been married a year, which meant I didn’t have that much money. We were doing our anniversary trip along the California coast. Our anniversary trip had been a disappointment. We stayed in a Victorian-style bed-and-breakfast that just wasn’t what we expected. My wife gave me permission to go check out this flea market, and I go to the most sad, pathetic flea market I’d ever seen. There was an old man with a dog and a handkerchief, playing a banjo for money. It was really depressing. It didn’t look like I’d find anything great. Then I see this old couple. They looked like grandparents. They were selling the leftovers of what must have been a video store. They had curtains hung, and I saw they were using them to hide products. 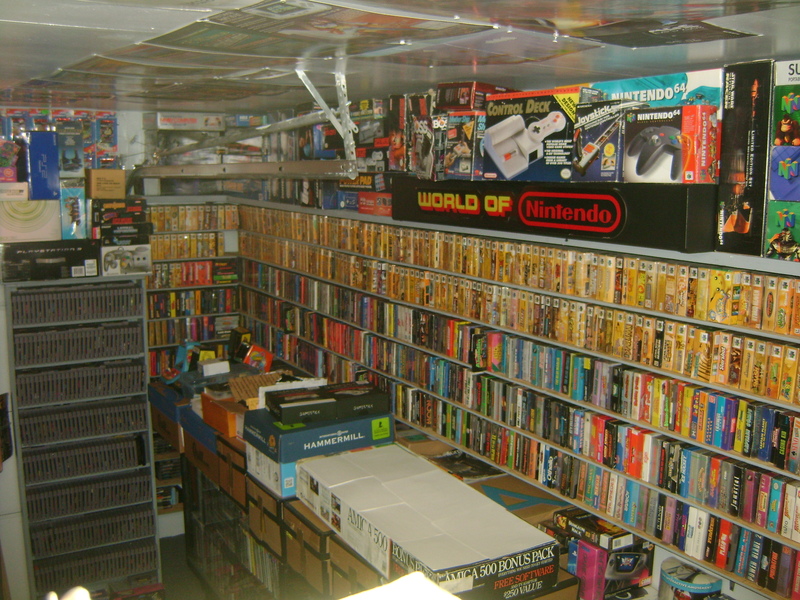 I asked, “Do you have any video-game stuff?” They said yes, and they opened the curtain, and it was like the gates of heaven opening up: nothing but boxed NES games. I walked away and drained our savings. The only reason I got away with that was because I got [duplicate] games I could sell quickly. That let me pay back our savings and score about 250 boxed NES games. That was probably one of my best scores. That was around 2002, 2003. There’s no way I could have done something like that now. 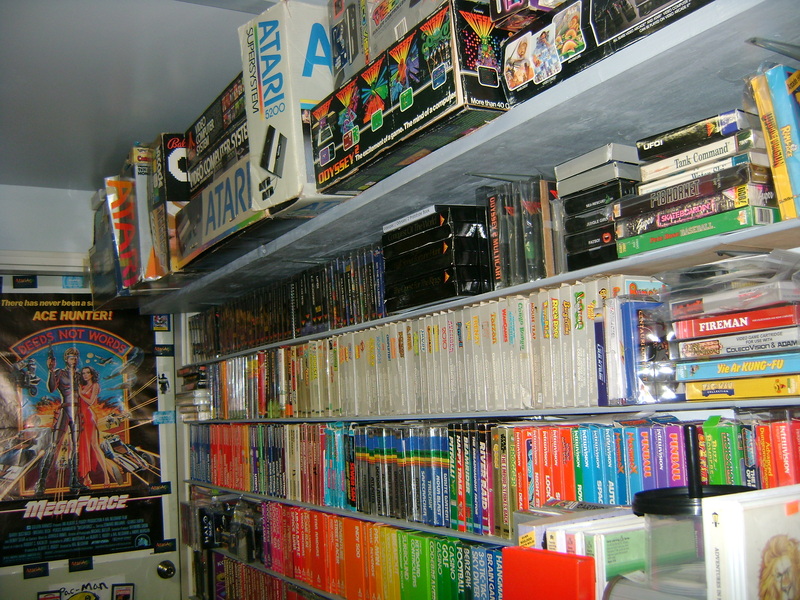 More (but not all) of John’s collection of Sega games and memorabilia. I read in another interview that you got a Coleco Adam console through a transaction that took two years or so to wrap up. What’s the story there? That’s exactly what he did. Another three or four months passed, and I got a call from him saying, “I’m coming up.” I actually had to make a shelf that fit it because it’s huge. The Adam computer box is huge. It’s way bigger than a 360 box. It’s big. It was a little damaged, but still in pretty good shape. It’s the expansion module 3; it’s really hard to get. For 80 bucks, it was a steal. The guy saw my collection and said, “I’m really glad I did this.” What happened was, [the Adam] had belonged to his dad. His dad died, and the Adam had been rotting away in an attic. Suppose a genie popped out of a lamp and said, “I’ll conjure up any game for your collection.” What would it be? I’ll cheat and say a Robotron arcade cabinet. But if it has to be a console game, I’ll say Magical Chase. It’s the last card I need for my TurboGrafx collection. 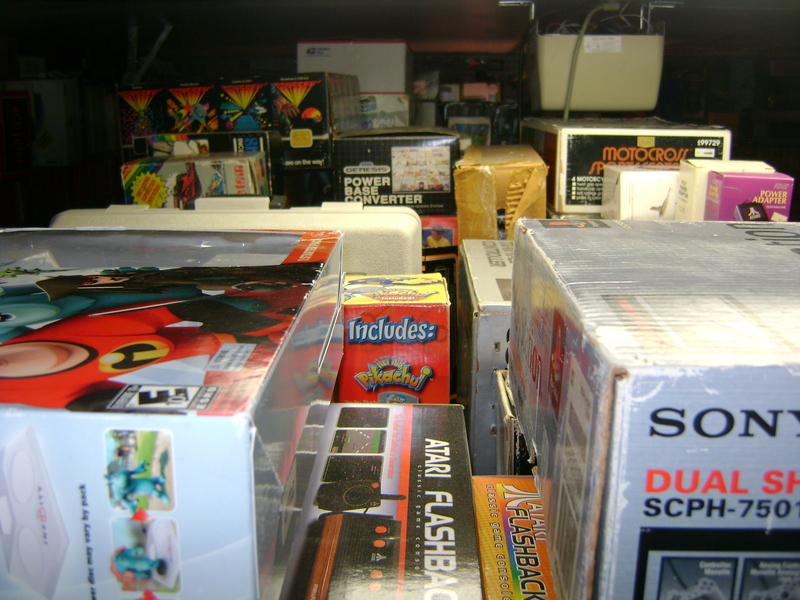 If you had the space and the money, would you expand your collection to include arcade games? There are pros and cons. One thing I’m noticing is that hardware is failing. It’s a nightmare when arcade hardware goes off. You have to fiddle with it and move it, and I don’t have the greatest back. I’d love to represent arcade games, but I’m also aware that it takes a lot of technical expertise to maintain them. Consoles are a lot easier. But if I had the space, yeah, probably. If I’m going to have a museum, I need to represent arcade games, even if they’re just ports or a MAME machine. I had an arcade game in my collection that was a reproduction of Williams arcade games. I bought it cheap from a good friend, and I decided to put it up and donate to a show in an auction. This kid bought one ticket and won. He called his dad and was super excited. He wanted me to sign it and everything. That was the first time anyone asked me for my autograph. The kid was in tears he was so happy. It was neat. More Atari games and hardware. What about boxes and manuals? How difficult are those to find? My friend Jon Rose knew I was going crazy over Sega Genesis stuff. He went to a video-game wholesale clearance center, and it was buying out all of the rental stores in California and selling excess inventory all in one shot. On the way out, he goes, “By the way, do you have any leftover manuals or artwork from video games?” The guy said, “Yeah, I’ve got all this Sega crap. I don’t know what to do with it, so you can just have it.” He pulled out a box full of manuals and [game box] artwork. I absolutely love manuals. I understand why they went away, but there was something great about them, especially the NES and Sega Genesis manuals. The cheesy artwork, the stories, the listings for how you play, and they would always put a “?” over the final boss because they don’t want to reveal it. One thing I do is if there’s a rental store sticker showing the name and address of the store, I don’t remove it from anything I buy. Knowing that those rental stores are gone, those stickers could be the last thing left of that store. I have stuff from my original hometown that I got just for that reason: it’s a sticker from a video store that I went to as a kid. When you get a complete-in-box game, do you like to keep it closed, or do you like to open it up and play it? I’ve unsealed a couple of games. For one, I was testing some product for a video-game company, and I had to unseal my Action 52 for Sega Genesis. I’ve done that. I’m not a sealed collector and never have been. Part of the reason for that is money. To each his or her own, but for me, I want to play stuff. I want to showcase it. The prices for some of that stuff is ridiculous. For that amount of money, I could get 20, 40, 50 games off my list. Digital gaming has become ubiquitous. PC games are rarely put out on disc. I can go on the Wii U Virtual Console and get rare SNES games for less than 10 bucks. As a collector of physical media, what are your thoughts on digital games? Do you think they affect the value of collections like yours? I definitely think we’re in a bubble. I don’t believe in the theory of things going up and up. I think rare stuff will remain rare and be sought after, but I also know that an entire generation of kids are growing up without physical media. Media fails. I collect modern games. I have a Steam account. I don’t have a lot of Steam games, but I like the service. It’s a good service. I have Xbox Live, and I download the free games every month. But there’s something missing [from digital games]. There’s no box. The manuals [are sparse]. For me, it doesn’t feel like a complete game if it’s digital. For a lot of people, that’s all they know. I guess it’s kind of like vinyl. We moved from that to a CD and lost something in translation. That’s how I feel about physical versus digital media: digital isn’t the same. 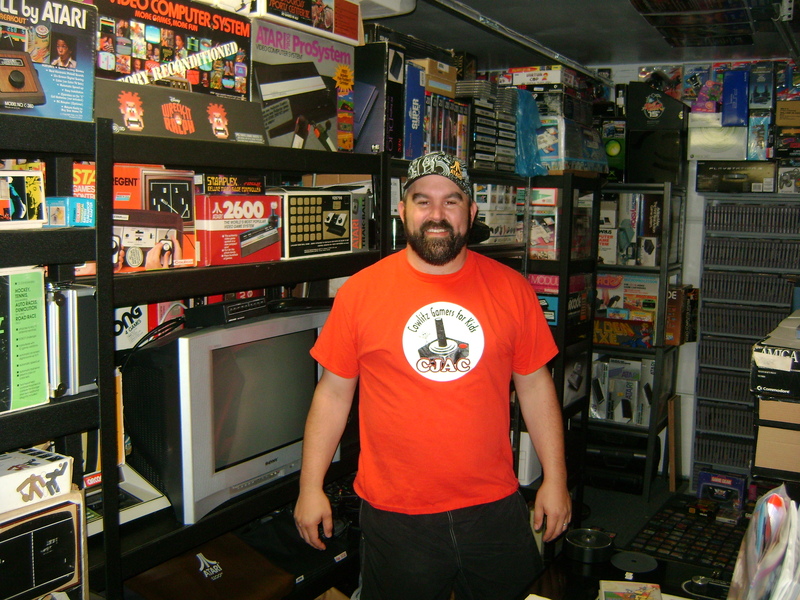 John standing proudly in his game room, arguably the Mecca of gaming collections. But at the end of the day, I’m coming from the perspective of growing up in an era where people felt like they owned games. Now, it’s more of, “Well, you have permission to play our game. You can borrow it. You have access to it.” That’s just not what I grew up with. I grew up owning games, borrowing games from friends. You can do the same thing with Steam, but it’s just different. As far as value: it’s hard to tell, but I didn’t get into the hobby for money. When the warning signs appear, when game values start dropping off, I think that’s when a lot of people will cash out. And that’s okay. I’m not in it from money. I’ll be in it for the long haul. I just don’t want that to happen because I have a lot of friends who rely on [collecting and trading games] as their main income. We’ll see. I look at myself as being like those guys at railroad stations who are really excited about trains. They’ve got their little conductor hats on, and they’re just happy to talk your ear off about trains. I see myself like that.